FAQs on Aquatic Insects by Group: Beetles, Dragonflies,, Freshwater Mites, Mosquitos/Mozzies and much more! I have spent countless hours here and on Google trying to solve my problem. 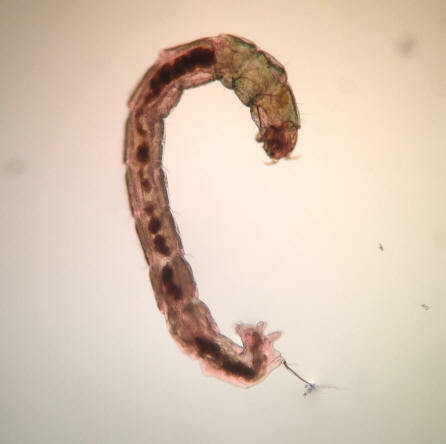 I have identified what I think is midge larva in my tanks, first they were in my sponge filters, which I removed and cleaned replaced with hang on the back filters. Now they are back, which are driving me crazy! I have a 30 gallon tropical tank with 6 Cory catfish and 7 neon tetras, in this tank I never see them free swimming, however they are in the filter and filter media. Within days I can see their little casings in the media and if I rinse the sponges there are hundreds of them! My second tank is a little more of a pain, in it a have an adult axolotl and the larva are in everything. Sand, filter, sometimes on the glass resting. I’m assuming this is because my axolotl is too big to make a snack of these critters. Everything I have read says they make good free foods and to leave them however, larva turns into something, and I do not want an infestation in the rest of my house! I also have two 10 gallon tanks in another part of the house with two juvenile axolotl that is completely healthy and pest free, just these two tanks in my basement living room. How can I get rid of these things for good? I am constantly changing water and filter media to control the numbers but never see flies, just the worms in the filter and axolotl tank. 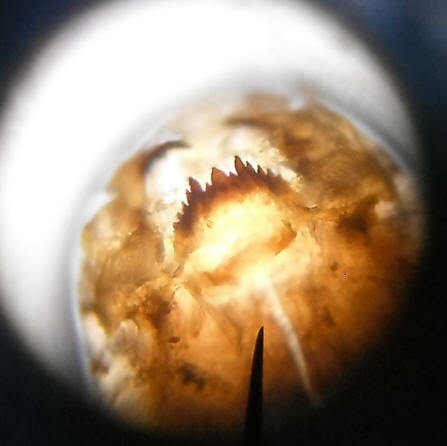 * I apologize, I forgot to attach the photos I was able to take of the larva. I have put an avocado pit in water and after a few weeks, I found these worms in the water. The most pointy side are mostly at the top of the water, as if for breath! I have a newly planted freshwater aquarium with no fish. I have a few Amazon swords, crypts, and Anubias plants. I have 2 t5 fluorescent grow lights. 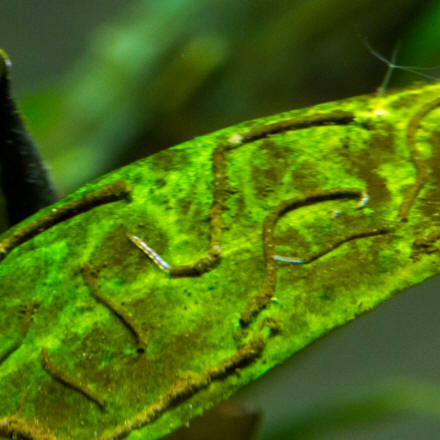 My planted tanks has some kind of dark green algae with squiggly lines and with some kind of worms. The worms are growing in some kind of single tube. 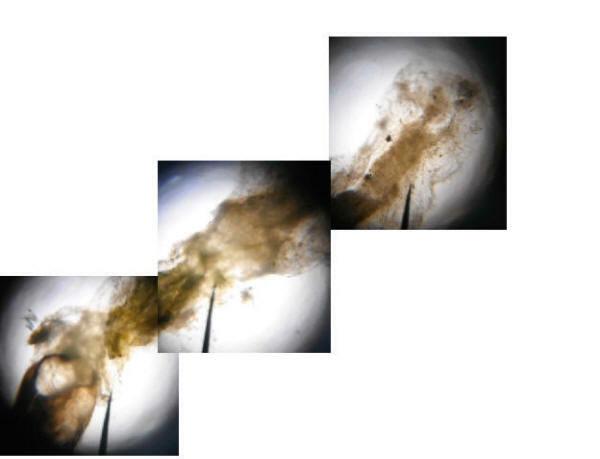 The worms poke their heads out of tube for a few seconds and then go back in the tube and hide. I can't find anything like them on the internet and was hoping you might be able to tell me what they are and if I should get rid of them and is it safe to put fish in the tank with them? Here is a couple of pictures. Thanks in advance for any help you can provide. Sincerely, Robert. Can you guys identify what these are? They appear to be little white worms in the water but zoomed in they look like larvae of some type. This is in a new setup about 4 weeks old, no fish, fresh black onyx sand, RO water, and 81 degree temp. They seem to have come out of no where. Thanks in advance. Video below image. Can you guys identify what these are? They appear to be little white worms in the water but zoomed in they look like larvae of some type. This is in a new setup about 4 weeks old, no fish, fresh black onyx sand, RO water, and 81 degree temp. They seem to have come out of no where. Thanks in advance. Video below image. Thanks for the reply. I added what is now a very full and satisfied Platy to the tank. The thing couldn't get to the little morsels fast enough. Happy to say that all wigglers are gone. Any clue? I've asked around, yet nobody seems to know. <Mmm; would like a bigger, better resolved pic... My initial guess is that this is a juvenile Tunicate, a larval Ascidian of some kind/species. I had gotten rid of him, I didn't want him to harm my tank. Hi! I hope you and the crew had a great time during the holidays. I'd like to chime in on the erstwhile unidentified organism in the letter dated 1/1/2015. 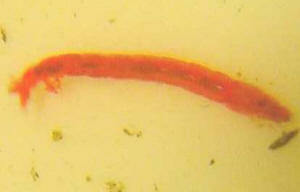 No info was given regarding the habitat, but if it was collected in freshwater, it might be a rat-tailed maggot. I had fun collecting these in anoxic creeks during my younger years in Manila (gosh the memories haha). Hope this info helps. Thanks for all the help you and the crew have been providing all these years, and wishing you all the best for 2015. I found in my boyfriend's fish tank. He has a 29 gallon tank that was purchased on September 27th. He currently has 3 Gold Danios and a couple snails. He's waiting for the tank to cycle before adding other fish. The PH is about 7.2. The ammonia fluctuates between 0 and 0.25, the Nitrites are 0 and the Nitrates are at 40. He's new to the hobby, but has done everything according to what the people at our local fish store have recommended. He keeps the tank at 76 degrees. He has an Aquaclear 30 filter. He has live plants that were purchased at the time of the tank, before the fish. He has, I believe, Fluorite Black substrate mixed with a little black gravel. We do weekly 10% water changes. During the water change, he suctions the substrate as well as he can without digging up plants. I'm not sure if all of this is useful to you in helping to ID these creatures, but figured it would be better to include it, just in case. I noticed the creatures about a week ago. They looked like small bits of root coming off some of the plants that have been floating at the top of the water. The creatures were green in color, small, and long. After closer inspection, I saw that there were also some that were a little larger and brown. I did some research (days of pouring over Google as well as your site) and couldn't find anything other than maybe a Damselfly Nymph, but still felt like it was unlikely. I decided to watch and see what happened. As they got larger, they started to look like they had little bug or shrimp bodies sticking out of the long, skinny, brown "shell," and I could see a "vein" pumping through the "shell." 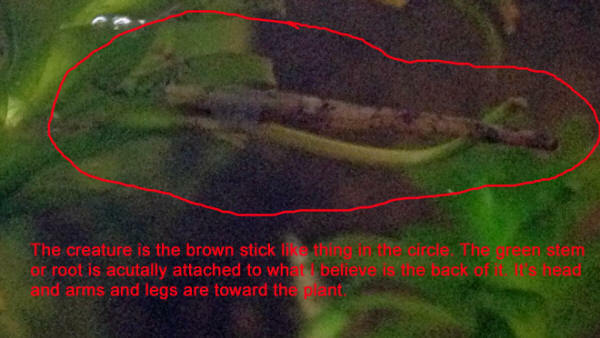 They also look like they have a long piece of plant root attached to their top sides. They don't seem to have a preference as to which portion of the tank they are in, as long as they are on something. hard as the biggest are only about an inch in length. I'm including a picture of a smaller one as well as a close up of a larger one from the top and a larger one from the side. My main questions are: What are they? Are they safe to keep? If not, what should I do? If they are, is there anything I need to know about their care? I've found them quite interesting to watch, so I'm hoping they are keepers. Thank you so much! Thank you so much! It looks like that is exactly what we have. I suppose we'll watch them, and once they have emerged from the water, we'll catch them and let them go outside. They're really quite fascinating! It's hard to believe they've built their cases out of stuff they've found in the tank! I really appreciate all your help as well as your quick reply! I have Googled till I'm cross-eyed, but still can't find any advice on a creature I've found in my tank when vacuuming. 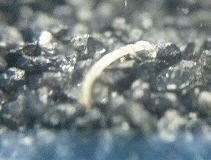 It looks like a silver grey spider, body about 5 mm long, 3 mm wide, 6 legs, and is quite active. The total leg span would be about 1.5cm. It was cleaning the muck off its feet in the bottom of the bucket and is quite cute. I'm reluctant to kill it or to put it back incase it's a parasite and my harm my large silver dollars. I know they're not in the right tank, I have a large bio-orb, which is actually difficult to clean as the filter sits in the bottom of the orb and is quite small, but they grew so quickly, I'll need to buy another tank. My local aquarium isn't much assistance, they couldn't identify the leech, red thread worms, or little white flea like creatures. Still, thanks for your advice. I'm loving owning fish and there's so much to learn. I now have 5 tanks! Started from one, but fish grew, bred, had personality issues.... I'd better learn quickly. Thank you for the response. Since I only have large-ish goldfish in the tank, looks like they will not be a problem. 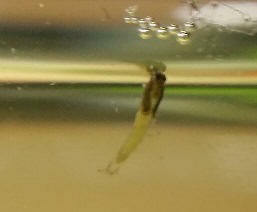 I do buy live plants for my fish to snack on, so I guess that was the ticket in for the larvae. I have a problem with larvae getting into the filters. 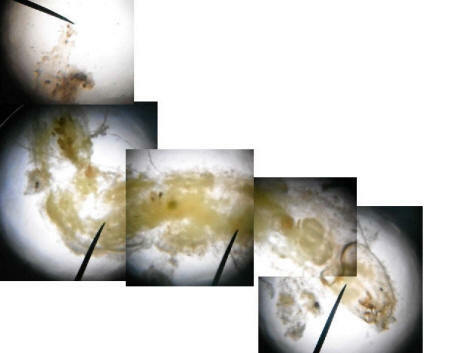 I know there's been questions like this asked but normally they describe white circles or worms that swim around in the water and are parasites. I have a year 1/2 old Red Eared Slider who resides in a 20 gallon aquarium with a waterfall type filter and a real log. While some may be getting in from outside and being attracted to the heat lamp, the larvae have been growing on the filters for a couple months and the filters have been replaced every time I've cleaned them. 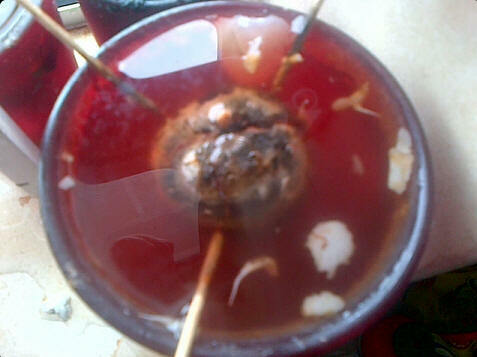 Do you know what this could be caused by? 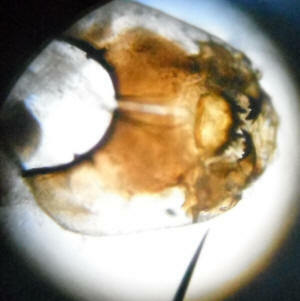 He eats Omega One Adult Turtle Sticks and the filters seem to have a type of rock in them and are white rectangles. I'm not sure of the brand at this time. He was found in a pipeline in a steel mill and rescued by my half-sister's dad who gave him to us. Thanks for your help, and sorry if this has been asked already! I have a 20g long shrimp only tank with a medium-fine gravel substrate, planted with Sagittaria, hornwort, java fern (medium density). 2x 18w bulbs, nothing out of the ordinary. Housing maybe 20 RCS, 15% water change weekly. pH ~ 7.6, all chemistries 0. I have found myself a damselfly nymph (am led to believe is this, and not dragonfly, due to longer, more slender body). Question is, are they detrimental to RCS population? I have removed one I saw (is roughly 1' long), do not see others. Is this a 'keep eyes open for more and take out as needed' deal, or something more drastic? I don't want to break this tank down for this. Any advice appreciated. Indeed a damselfly nymph then. 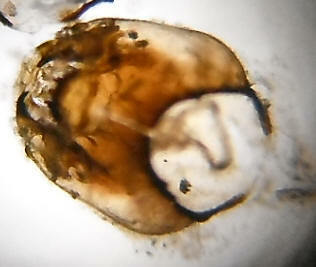 I have moved said nymph to another location, but in the absence of naked-eye visible ones, is it likely there are more? I suppose it's just a keep watch, remove as needed affair? 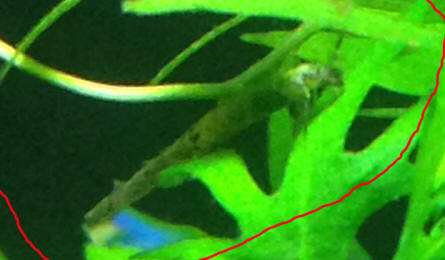 Probably half my shrimp are berried at various stages, so I don't believe population-wise the nymphs will pose an issue, unless they appear in large numbers. Just keep eyes open and remove PRN? Hi! We're currently residing in Manila, Philippines. It's happened twice already wherein we found more than a dozen thin black wriggly larvae on the countertop of our bathroom sink. It seems like they just magically appear out of nowhere. They wriggle their heads and tail ends from side to side. Really gross! I'm afraid they're harmful parasites. I'm worried for my kids. Help! What are they? And how do we prevent them from reappearing. I found a worm in my drinking glass this morning. I assume it came in through my tap water. Could you help me identify it?